Some lucky ones, Dog rescue and re homing in Sussex, Surrey, Cambridgshire, Bedfordshire, Huntingdonshire - www.desperategreekiesdogrescue.com, Dog rescue. Georgie Girl was dumped and in desperate need of help. Around 5 years old she was completely matted from head to toe, all her hair had to be shaved off down to the skin. Grass darts penetrated her body, some embedded deeply in her flesh. A huge mammary tumor was discovered, this was successfully removed, after 1 month she needed a second surgery to remove a smaller tumor, thankfully her chest Xray was clear so no secondary cancer. This sweet little dog is so loving, friendly and trusting. Georgie girl has a foster home. 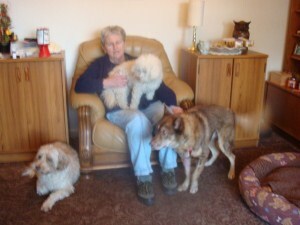 ​Sad news... Georgie developed a serious heart and lung problem, she had medication and stayed with her fosterer, sadly after a few weeks her lungs worsened and she was struggling to breath, we could only do the right thing for her now and she slipped away in her fosterers arms. Choco was found in a dreadful state, he had been totally neglected, he needed treatment for a condition that can be caused by being bitten by a sandfly, he also was suffering from a nasty infection caused by having many many ticks. 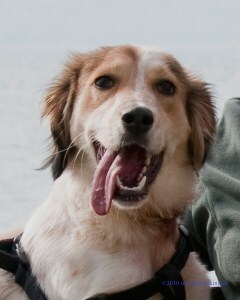 Choco was lucky to be rescued, treated and was helped by DG to a new life, he is now happy, safe and loved. Marina was found wandering in a marina, hence her name. The poor dog was very emaciated and needed vet treatment, she was very lucky to have been rescued, she was nursed back to health with medication, good food , love and time. Marina has had 2 surgeries to remove mammary tumours from which she has fully recovered, i am happy to say she is now living the good life. look through the pictures to see a happy girl at the end. Found living in horrendous conditions, skinny, neglected and bewildered poor Wendy had just given up. DG helped her to the new happy life she enjoys now. Bruno, another sweet boy, struggling to survive with a very badly damaged front leg, he had been chained and just left in terrible pain, his wrist was totally dislocated and had healed badly twisted and useless to walk on, he had suffered unmeasurable pain alone, on arrival in the UK he had a successful surgery to straighten his leg. Alfie a sweet puppy was the victim of a hit and run, he was left to die in the road, he had extensive injuries that were now infected when he was found, he was very lucky to have been found in time, after surgeries and treatment for weeks DG helped him to a new life and he has never looked back. Healed and very happy in his lovely home. Chip another puppy left for dead in the road, this lovely boy was plucked from near death and put back together over several weeks, he is now living a grand life. 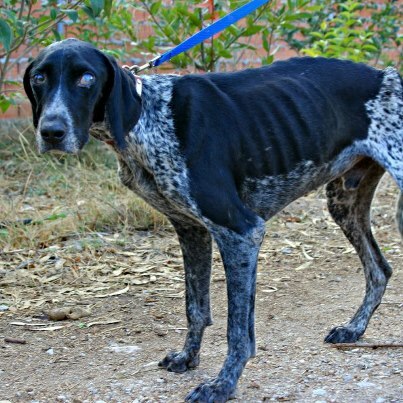 Sweet Pippa, just about 1 year old, neglected, starved and ill treated!!! this dog was 7 kilo's on rescue!!! she should be around 18/20 kilo's!! the 'people' that owned this poor creature looked at her everyday and just didn't care how they were making her suffer!! 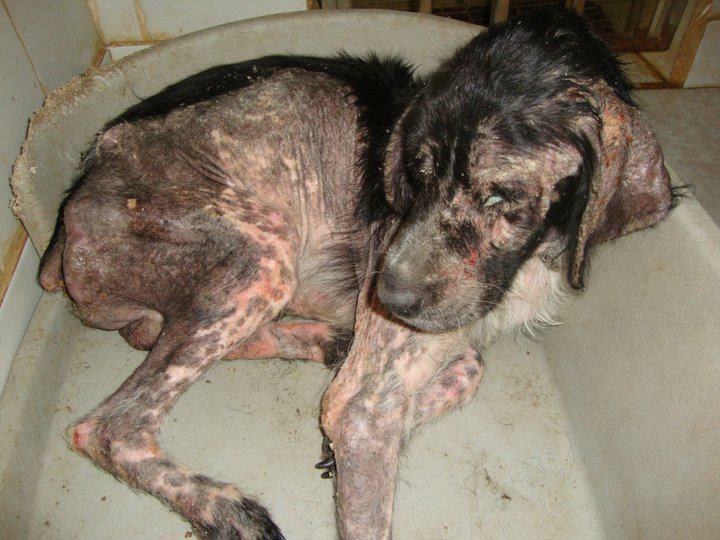 Unbelievable but this is the fate of countless dogs and indeed other animals in Greece. Pippa was very lucky and this awful existence came to an end for her, she was discovered and finally rescued, after visiting a vet and many weeks of good food and loving care she now lives the good life and is happy and settled, the vile cruelty she had to endure is over. Tragically there are many more Pippa's that don't get any help and eventually after so much suffering death is the only relief! 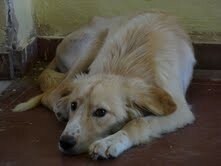 Kev is the most wonderful dog, he is but 1 year old, found Sept 2012, very sad, very thin, losing hair and itchy! he had Sarcoptic mange, he had scratched and bitten himself so much his skin was very red, he had scabs, spots and sores all over him, he was in terrible condition, it was pitiful to watch him being tormented every minute of every day and night, unable to get any relief! Finally he got treatment for the mange, after waiting for the mange to clear (its contagious so couldn't move him until it was treated) we got him to the UK, he also had staphylococcus infection where he had damaged his skin so much, his ears were raw and bleeding with constant scratching, this infection in itself made him itchy, he had lots of tests which showed he is allergic to dust, trees, grass!! Treatment began, 5 weeks antibiotics, steroids, baths, he had to constantly wear a soft buster collar, socks, fleece jumper to stop him damaging himself, the steroids had to be increased until we reached a level where the scratching got less and then stopped!!!!!!!!!!! it was amazing for us but for him it was life changing, he had a spring in his step, he slowly put on weight, we could no longer see his ribs, he still has the steroids but a low dose, we are currently still under the vet and take one week at a time, he has become happy, confident and really enjoys himself now, he lives with us, 10 other greekies and 4 cats, a fantastic very lucky boy. In the video he has now put on nearly 6 kilo's and weighs a healthy 22 kilo's, his coat continues to grow back and is getting thicker. 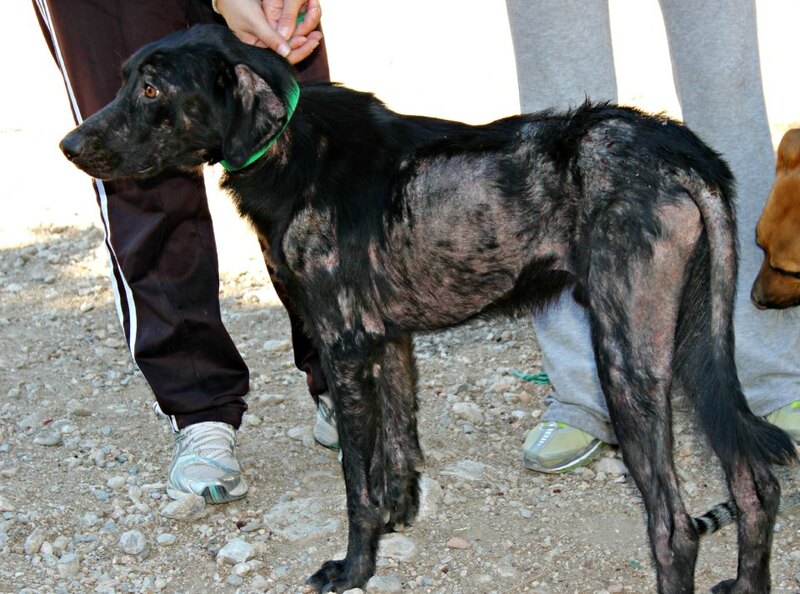 These pictures show him after treatment for mange began, he was so red and sore, so sad, every day was just misery! January 2013, Kev now 25 kilo's his coat is all grown back, life is happy everyday now for him. Cecil is a sweetie, we dont know where he came from or what his tragic story was but whatever his story he was in an unrecognisible state and was desperate for help and nobody cared whether he lived or died! Unlike so many Cecil got help and is now living a wonderful life in the UK with very caring people that have since helped 3 more Greek dogs, he also lives with 10 cats, 1 of them being a Greek rescue. 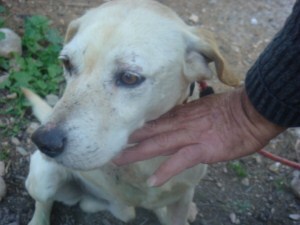 Poor Danny, probably an abused hunting dog, chained, starved, neglected! His 4 canines have been filed down! this is a painful barbaric act a lot of hunting dogs have to endure, inflicted by there so called 'owners' this also breaks the enamel and damages the teeth, some hunters do this to stop the dog from damaging the birds they pick up, he cant see very much but is the most adorable dog. We think he is around 7 years old, he was doomed to die a lonely, painful death and was well on the way to starving when he got really lucky and found himself being rescued, he is now in the UK and looking very much better, he is currently being fostered. Now he is strong he is lively and alert, he loves to go for long walks, mixes well with other dogs, is very affectionate and loves to be stroked and cuddled. Danny just after rescue in a very bad way! Video of Danny at Michele's house having just arrived from Greece, enjoying some food and a walk, he just fitted in so easily and was so happy for some home comforts and company. Roger was a stray, unwanted, unloved, forgotten... as he struggled to survive on the streets being tiny and weighing just 4 kilo's he was badly injured! his little face was ripped open and he lost an eye, as he lay at the side of a road in shock and losing a lot of blood, he would not have survived! he was so lucky to have been helped and taken to the shelter where they did there best for him. He took a long time to heal, during this time he was prepared for his pet passport and now his story has a happy ending for him, he is safe, loved, very happy and is learning to trust and enjoy his new life, the pictures are too distressing to show of when he was first injured but just look at the difference in him, its hard to believe this is the same dog. Note the change in the look in his eye, from despair to contentment. 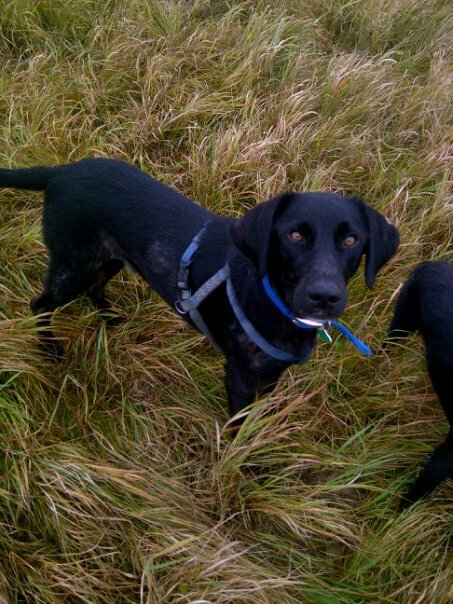 Dodge is now fully recovered, weighs 8 kilo's, his coat all grown back, he is happy everyday and is loved dearly. Sweet natured Bobby who is about 5 years old was found with his leg hanging off, the bone exposed, the flesh around his shoulder rotting! the pain must have been unbearable, badly infected, we dont know what had happened to him, we wondered if he could survive this terrible infection, he had to have his leg removed, lots of antibiotics and attention to keeping the wound clean. These pictures are 2 weeks after surgery, he is the most affectionate dog, we will be looking for a loving home for him, For now he is confined to a very small pen, there is nowhere else to put him while his wound heals which will take considerable time. update: Bobby's leg is all healed, he is in a home in Germany. Bobby has adapted to 3 legs already. He will make a super companion. Poor Lucy was dumped near the shelter. 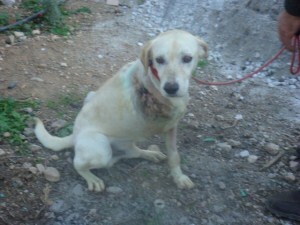 She had a horrific neck wound which was caused by being chained up. The chain was still embedded in her neck! Just look at the extent of this little girls injury, it just beggars belief!!! A tie wrap was embedded in her neck! We arranged for urgent vet care. The wound was treated & she was spayed at the same time. Her horrific neck wound took 6 months to heal!! It was a real struggle but finally Lucys wound has healed beautifully. 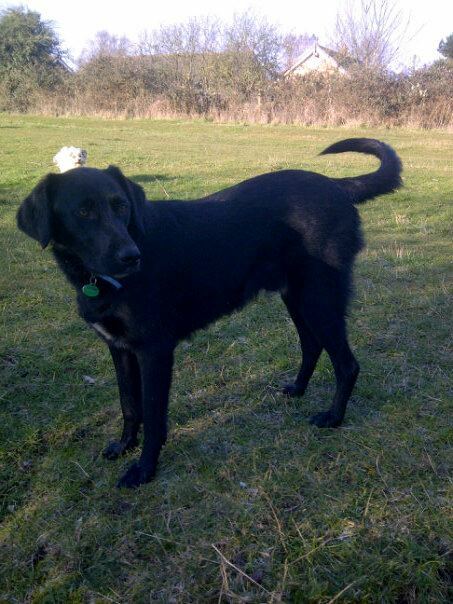 Lovely Lucy has now found her forever home in the UK and looks forward to a life without neglect and suffering. Max was a stray, he was pitifully thin, scared, confused and lonely. Poor Max already with an untreated leg injury.. He would surely have been the victim of a road accident, but luckily for him he was brought to the shelter where he received medical care and was kept safe. 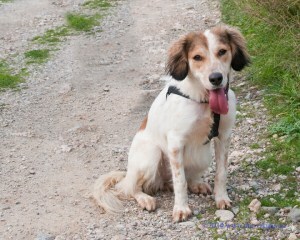 Max was prepared for travel to the UK and is now with his fantastic new family in a wonderful home. Red has suffered so much in his short life. He was thrown into a garden of an unoccupied house, just discarded! There was no food & no water available and no way of escaping. Although frightened and mistrustful of humans, Red has such a beautiful nature that he will be prepared for homing in the UK. We hope to find him a special home where his family understand and can help him overcome his fear caused by the neglect and abuse he has suffered in his life. 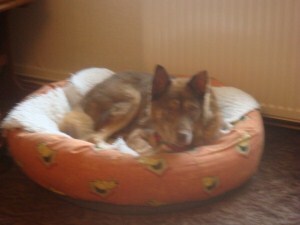 If you can give Red that special home please contact us. His poor emaciated body and internal organs just couldn't cope any longer, it is heart breaking that we couldn't help him, we hoped he would be lucky, rest in peace now Red. There are many, many stories and pictures that are just too distressing to show. 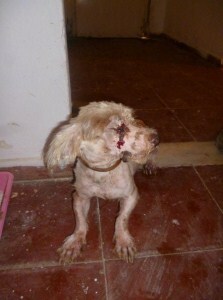 Please help us to help more dogs in desperate need. We urgently need Funds. 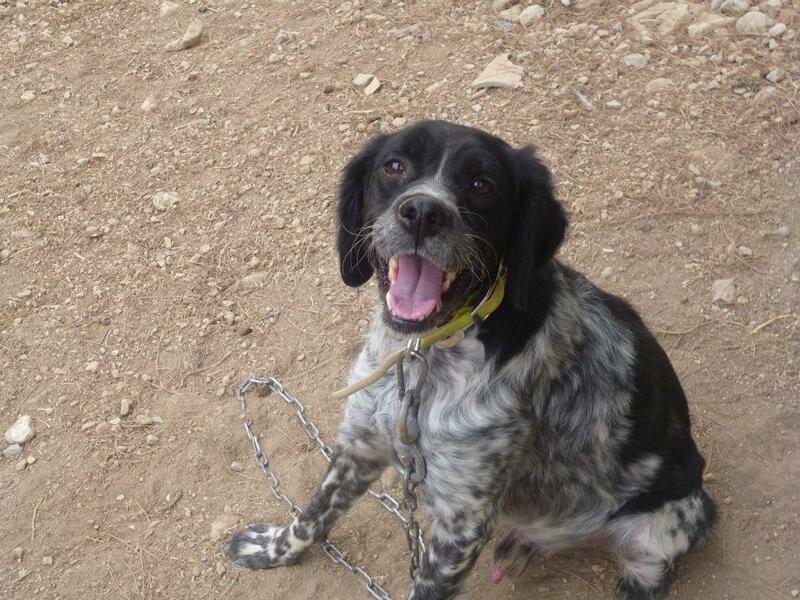 He is one of our lovely shelter dogs who has been prepared to travel to the UK. 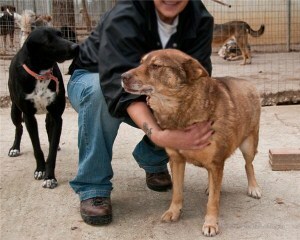 Choco has spent the last 5 years at the shelter and now has the chance of a wonderful life in the UK. However poor Choco suffered a terrible injury just a few weeks ago. 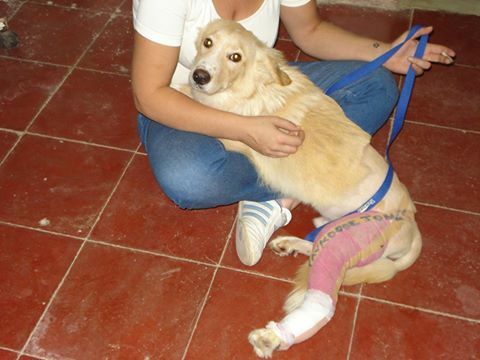 He had his leg pulled through the wire kennel fencing by another dog causing extensive injuries. 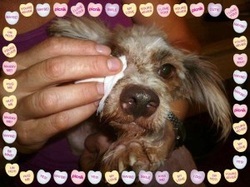 Choco was rushed to the vet and received treatment. His wound is so large and infected that they are not certain that he will keep his leg. The vets state his treatment will cost approximately 700 euros. The shelter simply doesn't have the money to pay for all his treatment. This brave lad is doing well, its a miracle that he's managed to keep his leg. His wounds have slowly healed, its taken almost 3 months! the last bit is in a very awkward place (the join of his leg to the body) so this is slow to heal, this took approx 6 months to heal. We never thought he would keep this leg, never mind walk on it and despite the rough time he has had, this good natured boy has never complained. 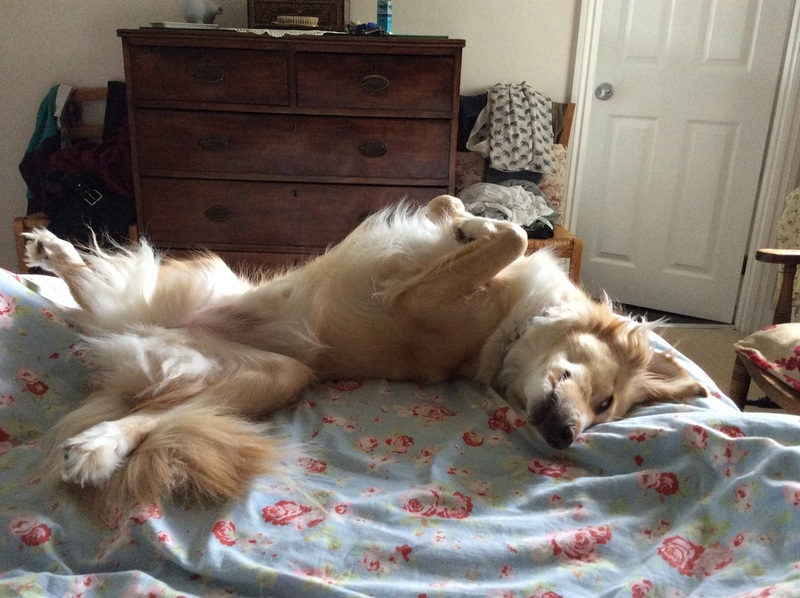 He is a very special dog.